HomeWhen Is a Nightmare a Good Thing? Such self-deception directly threatens the image we want to portray as someone who is control and who knows what they are doing. It is a direct threat to our sense of security. Such threats to our self-image provide one important reason why we do not remember our dreams, since our dreams are full of self-deceptions. We think we are awake when we are dreaming and we think that the things we experience are exterior to us when they are interior creations. For the most part what you experience when you dream is self-created, in that it was produced by some aspect of your consciousness. This default position causes you to take responsibility for your self-deception as well as the extraordinary abilities that sometimes express themselves in dreams. Both are equally important. This is true for waking nightmares as well as dreams. Spirit does not differentiate. We routinely do the same thing in our waking lives: we confuse waking events with our interpretations of them. Somebody cheats on you or lies to you and you take it personally. It’s a very bad thing. How did you reach that conclusion? How objective is your judgment? There is what happened and there are the multitudes of possible interpretations of what happened. Which one did you choose to accept and why? Events are neither good nor bad; it is our interpretation of them that makes them good or bad. This is a basic truth that we know but we fight. We instinctively want to say that tragedy is bad and success is good, that evil is bad and love is good, that unhappiness is bad and happiness is good. If we want to learn to look at life from the perspective of spirit we will come to look at life as a product of our perception rather than as something “out there” that is good or bad, real or false. 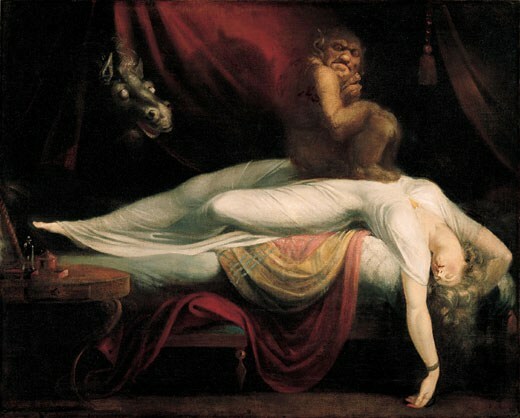 What are examples of waking nightmares? Post-traumatic stress disorder not only contains nightmares but is itself a waking nightmare. Traffic accidents, heart attacks, cancer, divorces, and deaths are personal nightmares. Wars, famines, epidemics, terrorist attacks, and the control of governments by fascists are all socio-cultural nightmares. To respond to any nightmare with repression, suppression, or avoidance is a very big mistake. This is because it gives the nightmare power. If the nightmare is self-generated, as it most certainly is, then we are afraid of ourselves, fighting with ourselves, and defeating our own development. We can see this with the U.S. response to 9/11. When it responded to the destruction of the New York World Trade Center with war ithe U.S. ignored how its policies created the circumstances that allowed terrorism to grow. Instead of learning from those mistakes, it externalized its fear and started two wars, one against Iraq and the other against Afghanistan. The result created a nightmare of death, head injuries, and post-traumatic stress for U.S. soldiers, shamed the nation with torture and other horrible abuses of human rights, and depleted precious national resources that needed to be directed toward rebuilding infrastructure, education, and creating a green economy. Just as war is an externalized over-reaction to an internal nightmare, so are most fights with friends, lovers, and family. Unlike national and global nightmares, over which you have little direct control, you can turn your life nightmares into something good. The way to do so is simple and fairly obvious: instead of assuming that nightmares are bad, assume that they are helpful. Do so first while awake and then ideally, while you are still dreaming. Learn to assume that all nightmares, in any state, are wake up calls. When you treat a nightmare as if it were a wake-up call you get completely different results than you do if you assume that it is a threat. First, you are admitting that you deceived yourself and scared yourself. You have given up the need to base your security on not being mistaken and not being scared. Your sense of self has grown to include acceptance of self-deception, fear, and threat. Integral Deep Listening provides a methodology by which you can take any nightmare and turn it into something positive and productive in your life. When there is a clear “villain” one can simply interview him or her. When the entire situation is nightmarish, you can take your feelings about the nightmare, let them become a color or colors, and then watch the color or colors turn into a shape and interview it. There are examples of this procedure under the post category, “Unding Nightmare Life Scripts” at the DreamYoga.Com and at the IntegralDeepListening.Com . Anyone can create a Dream Sociomatrix and Dream Sociogram about any situation. Mine will be different from yours, but while yours may change somewhat over time they tend to produce relatively consistent patterns for the same person regarding the same nightmarish situation. You will come to understand how your preferences create your reality and gain the objectivity to stand back from the self-created dramas in your life so that you can learn to witness your life from a stable context of inner peace. Next PostWhy did I have that monster in my dream?